The month of Ramzan is incomplete without a soul-satisfying iftar spread. And what’s a hearty dinner without biryani, paya and galouti kebabs? 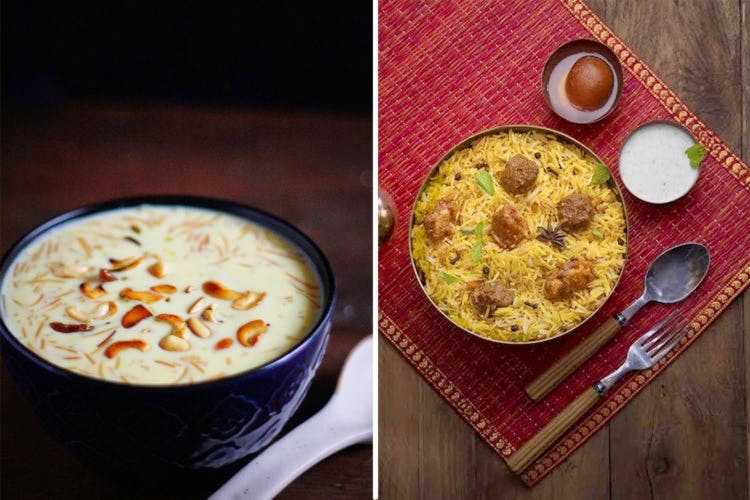 Scroll down to find out where to get the best of Ramadan food. One iftar dish that you absolutely cannot miss is the raan biryani. Made of mutton legs marinated in hung curd, malt vinegar and ginger garlic paste, the biryani comprises mouthwatering layers of basmati rice, pinch of saffron, fried onions, garam masala, hard boiled eggs, fried cashew nuts and raisins. The best raan biryani we had in Pune was at Bagban on East Street. Priced at INR 990, the meat is succulent and the rice is well-layered in spices. Worth a try! Paya is a tradional curry or soup made of goat or lamb trotters. The dish is quite light and flavoursome on the palate and is slow-cooked in sautéed onions, garlic and spices. If you’re looking for the perfect paya in Pune, don’t look beyond Qabil-E-Tareef in Pimple Saudagar. We love their murg paya shorba, which is basically a delectable chicken soup with fresh turmeric, garlic and black peppers. Originated in Lucknow, galouti kebabs are melt-in-the-mouth meaty delicacies that are must for any iftar spread. One of the yummiest galouti kebabs we ever had in Pune was at Taaareef in Aundh. Priced at INR 387, these kebabs are made of minced meat, gulab jal, desi ghee, hint of ittar and green papaya paste. A popular Middle Eastern stew, Haleem is an iftar favourite. We highly recommend you try the aunthentic Hyderabadi haleem at Zaheer Khan’s Dine Fine in Kondhwa. Priced at INR 395, this delicacy is made in mutton and cereals which are cooked overnight and then garnished with fried onions, mint leaves and lemon wedges. Shahi Tukda is a deep-fried bread-based dessert that is popularly served during Ramzan. Our recommendation would be try this dish at Naayab at Baner. Priced at INR 111, this sweet dish is religiously garnished in rabdi, pista, almonds and cashews. Sheer khurma or sheer korma is Persian dessert made out of milk and dates. We think you must try this delicacy at Mughal’s on East Street. Priced at INR 190, the dessert is made to perfection in vermicelli, dry fruits and saffron.